I found a fun gadget at the thrift store the other day and couldn’t wait to get it home to play with! 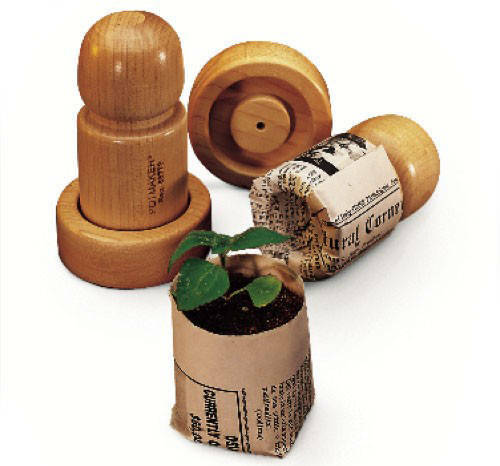 It’s a Pot Maker, originally made to form bio-degradable newspaper plant-starter pots for gardening. But being much more of a crafter than a gardener, I thought it would be the perfect tool for making party favor cups. Of course, you could make them for lots of purposes, but not for anything too weighty. And although I lucked out paying only a couple of bucks for mine, these are still very available online retail and on Ebay and Etsy. 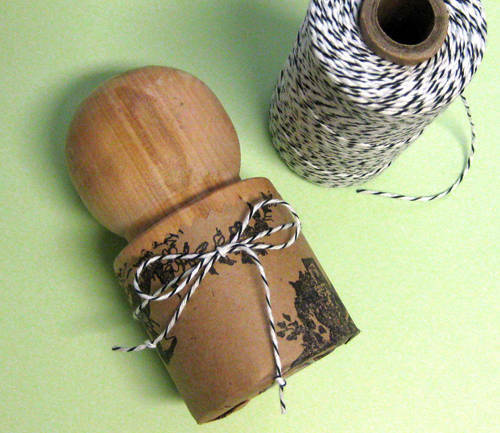 There’s really not much to it, you just wrap paper around the wooden cylinder, fold the ends under and smoosh into the wooden base. Since my paper pots won’t be going into the ground, I used tape to reinforce the wrapped end of the paper on the back and another piece on the bottom. These pots form best using lightweight paper. And if you’re going to tie cute string around it, be sure to do that before you remove the paper from the form and secure it with a small bit of tape or glue on the back. 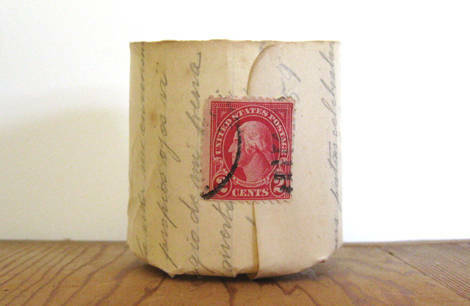 I tried out lots of different papers from gift wrap to vintage ephemera. 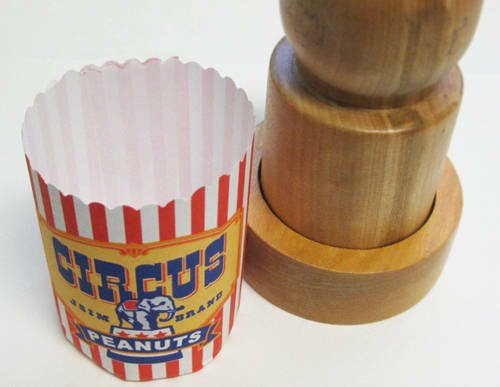 Then I designed a cute peanut cup graphic for you to use on this project (or you can also print and fold the graphic into flat pouches for snacks as well, or wrap as a label around a can.) Just click on the graphic to access the file. 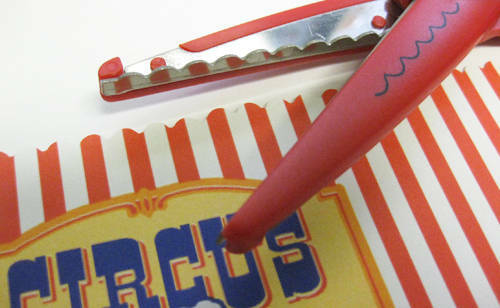 You can size the art to print 2-up on letter stock. 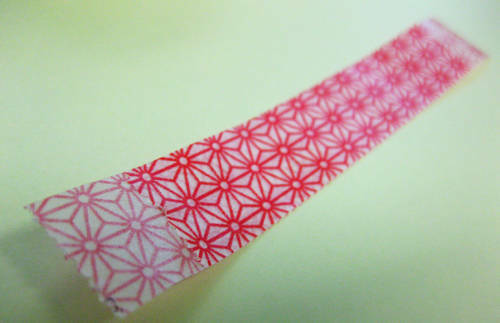 Once printed, I trimmed mine along the top edge with scalloped craft scissors. Here are a few more ideas I came up with today, but there’s really no limit to where you can take a little favor cup! 1. Gift wrap, scallop cut and folded over at the top. 3. Book cover image that I thought would be a fun idea for snacks at your next book club meeting. 7. Handle basket made from vintage sheet music and Washi tape. 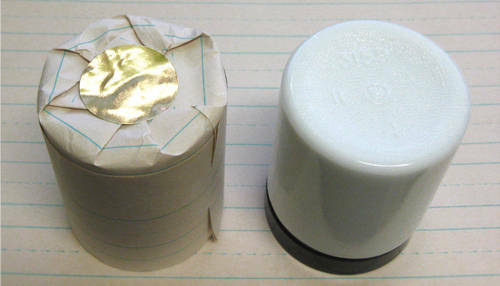 To make the handle, simply press two pieces of tape, adhesive sides together, with the underside piece being just smaller than the top piece, leaving enough sticky at the ends for attaching to the basket sides. And the cup in the very first image is made with handwritten paper from a very old notebook and finished with a vintage postage stamp. The great thing about this project is that you don’t have to have an actual Pot Maker to make these cute cups, any small, straight-sided jar will do. 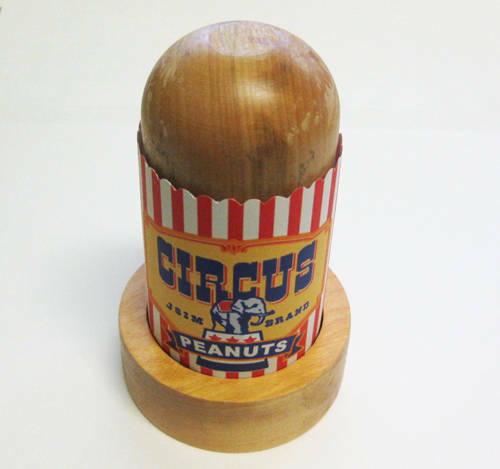 You can finish off the bottom with a large round sticker or seal. You are so darn clever Cathe! LOVE this idea! You have an amazing brain. Ah! I’ve been dreaming of such a device forever! I didn’t know they existed! Oh man… I can’t even begin to explain my excitement over this! Thanks for all the inspiring ideas. Sooooo cute! And a perfect way to use all of the extra little pieces of paper I collect. I also save catalogs that use heavier paper like White House Black Market. They have beautiful fashion photos – fill them with pink M&M’s and place them on co-workers desks for Breast Cancer Awareness Day. So what will you do with all your paper cups? 😉 They’re really cool, and having seen that gadget before I love to see what you’ve done with it! Brilliant as always. I’m envisioning place-cards at Christmas with little pine trees planted in them, snacks at kids birthdays, homemade goodies at bake sales, wedding favors, mini Easter baskets, May Day baskets – my mind is reeling! Oy, Cathe those little favors you created are sooo cute! Great use of a gardening tool for crafting! i’m still thinking it would be fanTABulous to have a pot maker like that. so much fun! That is marvelous!! I’m sure I would have just passed that little jewel right by at the thrift shop. You’ve made such cute containers with it! OMGosh I love these. How clever. You always have the best stuff. I can think of so many ways to use for them. Can’t wait to make one. What a great little gadget and idea! How adorable ! I have this & made them for starting my garden plants in !! Mine were not cute , but may have to use my pot maker now to create some cute one’s ! Link to my post about pot makers ! This is a really cute idea. Congratulations on your new blog home! Is there any way that you can set it so that the full post appears in Google Reader? Now there are only a couple of lines, then we have to click on “read more” to see the rest of the post. Hi Lynn, Yes, we are working to fix that now. Hope to have it all done soon, thank you so much for your patience!! Lovely! I have a pot maker, never thought to use it for anything else. Now, Cathe, I have one of these things and it never occurred to me to make anything with it other than seedling pots! Time to haul it out of the garden storage area and get cracking with some fun holiday place setting containers. Thank you for your new view of things. Always delightful. I’ve seen those tools for years and would never have thought of using them for something like this. All your designs are great, Cathe, but I especially love your photo idea on the Thanksgiving one which could work well for many different occasions. How cute !!! You are an evil genius !!! VERY cool!!! Charming and fun. Love them. Oh my GOSH! This is the best idea I have seen in a long time. Thank you so much for sharing, and especially the fabulous pictures! This is something that I can do!!! I love it. What a great Idea and I even have one of these gadgets!!! Yaa hoo! What a great simple lovely idea! Love these ideas! Someone just left a comment on my blog because I posted the other day about finding one of these at the thrift store. What a funny coincidence! I too am dreaming of all the things I can make with it! I’ve often thought of getting one of these for my seed planting. I’ll definitely be looking for one now. Really cute projects! My daughter-in-law gave me one of these pot-makers a few Christmases ago and then just emailed this link to me! 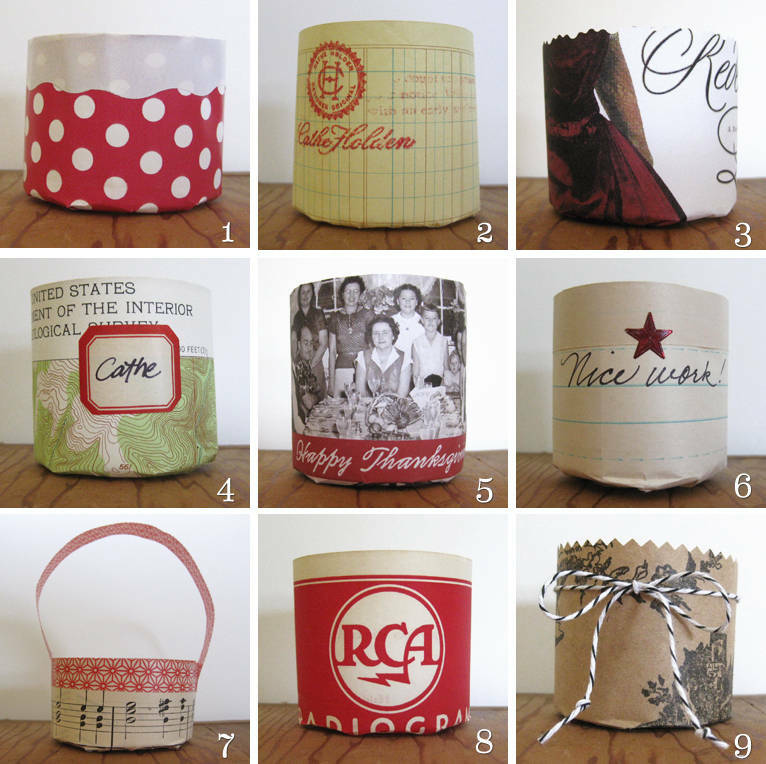 I have yet to make a pot – but I will definitely try these ideas – even for gift-giving! Why didn’t i think of this???? I’m such an idiot! I have had a paper potter for years and of course used it for growing and potting on seedlings but it has never occurred to me to use it with decorative paper. Genius! There is no stopping me now. Thanks so much. Cathe…these are sooo cool! I always wanted one of these for my seeds for the garden but not I really want one!! I think I will put this great idea to use…often the simplest ideas are the best! You can do the same thing with a plain drinking glass. What a wonderful idea, and so easy too! I could even make them for my son’s birthday party this month. Thanks for sharing. Am going to put a link to this on my website. Where have you been all my life. I love these cups! 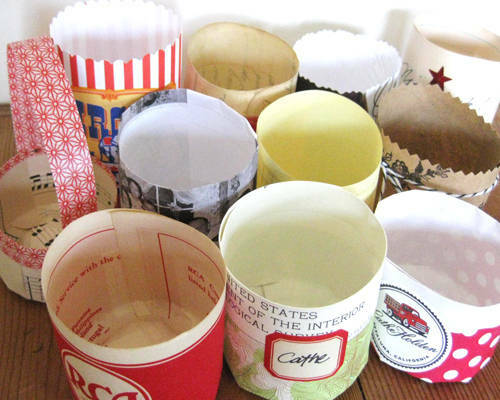 I have a million ideas for birthday parties, and now each has a different paper cup to go with them! Thanks. These would be cute with those battery operated tea lights! Love this idea Cathie , Can’t wait to try this . Thanks for sharing it with everyone. We are paper coffee cups and paper sleeve factory from china.we want to supply our products for you,and we want to build business with you. Please just feel free to connect with me if you need my help. Where would I find one of the wooden moulds?